Did I mention the rain? After three months of no rain, I arrived in Medellin. It was beautiful for three days. After that it rained every day and still does. It rained every afternoon and almost every night. Sometimes it rained in the morning as well. Although this did not significantly dampen my spirits, pun intended, nor did it impinge on my activities in Medellin, enough was enough! Additionally, the rains have caused many mudslides, at least one fatal. Leaving Medellin, I had an uneventful two hour bus ride to Guatape, a pretty town on a very large lake with many islands and inlets. 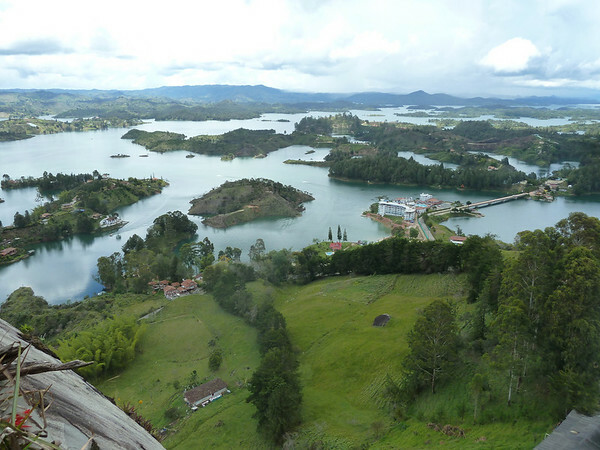 The lake was created by the Colombian Power Compan in the 1960s as part of a huge hydroelectric project. A notable attraction in Guatape is the Penon de Guatape which claims to be the second largest rock in the world (after Ayers Rock, Australia). I cannot verify if this is so; however, it is a huge rock that can be seen from several miles away. It was Palm Sunday morning and I wanted to climb to the top. I left my lovely lakeside hostel and began the one hour walk around the lake to the base of the rock. 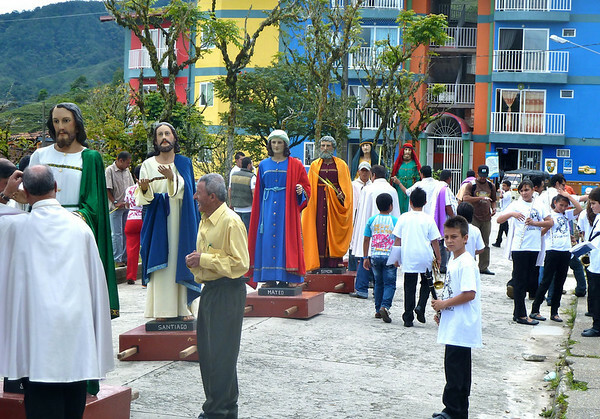 As I went through town, a local church was getting ready for a big Palm Sunday procession. A rather large marching band of children and teenagers were tuning up and many lifesize figures were being carried into place. 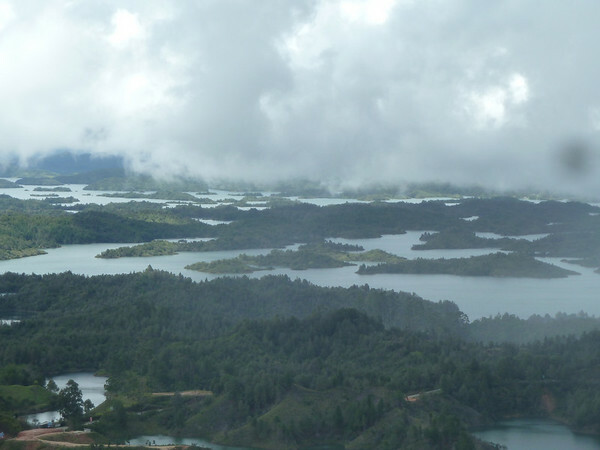 I continued my trek around the lake and arrived at the base of Penon de Guatape. 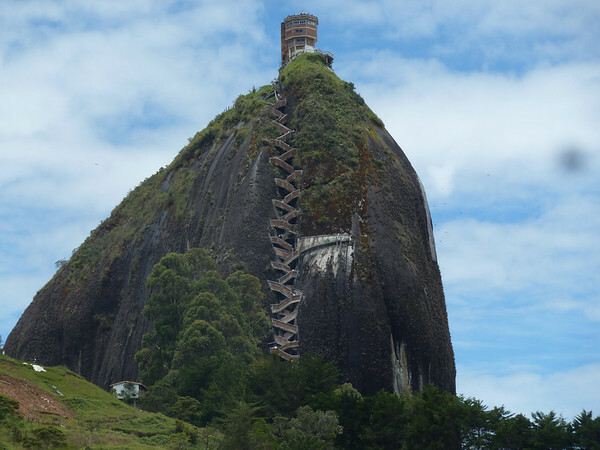 For eight thousand Colombian pesos, about US$4.00 you can climb the 648 steps to the top, a good aerobic workout. Once there you are treated to a 360 degree view of miles of lake. Fortunately I got an early start and was able to make the summit before the afternoon rains began. As the thunder, lightening and torrential rains began anew, I beat a hasty decent and looked for a ride back to town. Hmmm...Which Taxi Should I Choose? 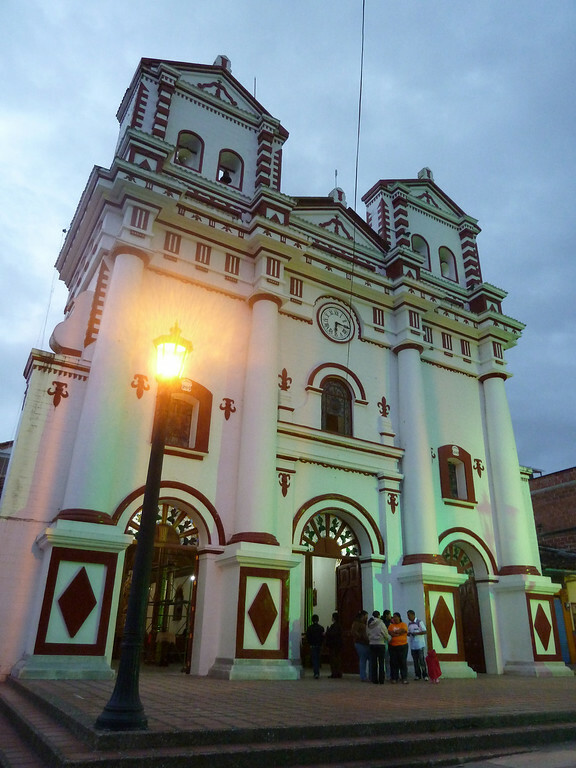 Arriving back in Guatape, I stopped to appreciate the shifting light of dusk illuminate the main cathedral. Wandering along the lake I had several rounds of street food including three different empenada vendors, chicken on a stick, and a Colombian favorite, grilled corn on the cob. 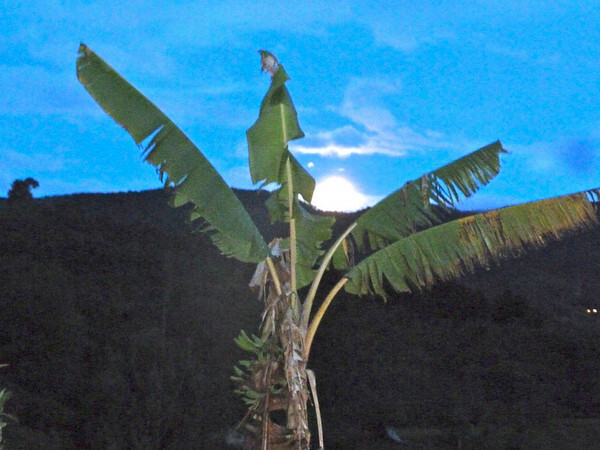 I arrived back at Hostel El Encuentro http://www.hostelelencuentro.com/ just in time to witness the full moon rising over the lake. Later, as I was getting ready to turn in, word arrived that the road had washed out again but crews were working to have it opened by morning. 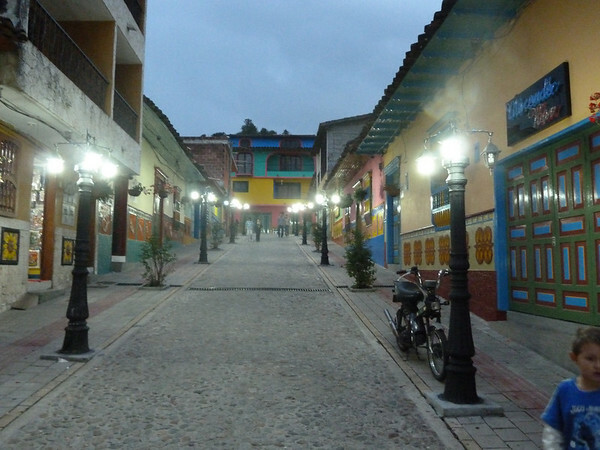 By 8:00 a.m. Monday I was packed and ready to head to Manizales. However, it would be another five hours before I could leave. Each time the road would get cleared, another section of mud would come down closing the road again. This was a two lane paved highway just a day before! Finally at 1:00 p.m. buses were allowed to leave. 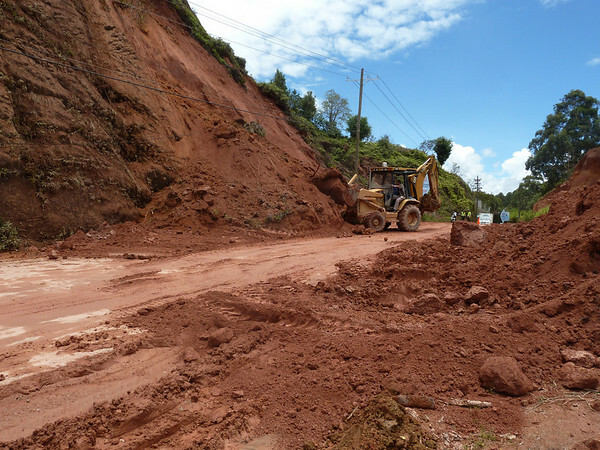 As I left Guatape, I passed the above site and three other similar slides. 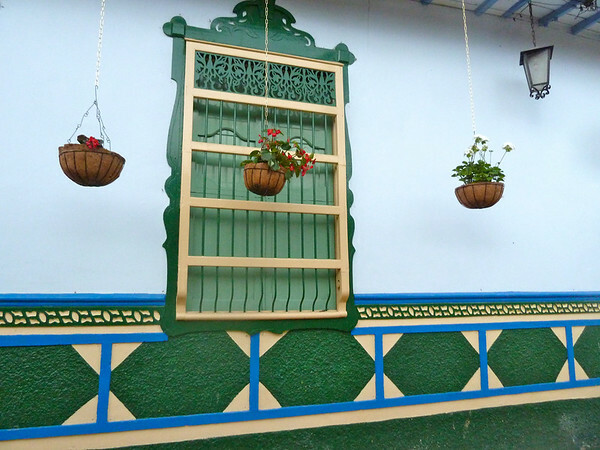 It was four hours back to Medellin where I transferred to another bus for the five hour journey to Manizales. Not sure where you are now, but living here in Guatapé on an evening when I have buckets and towels on the floor inside my apartment catching the deluge as it comes through the windows and roof, I totally understand your reticence to really talk about the rain here in detail…and I’m a veteran of many years in SE Asia. Happy trails! Hi Henry and thanks for stopping by. Sorry to hear about your leaky home. I wrote this post in 2011, when I was in your town. So I had to reread what I wrote. I see that I mentioned the rain quite often in this post. I am currently in Krabi, Thailand, and we have just started our rainy season. As you probably know from your travels, every tropical location has rainy and dry seasons. 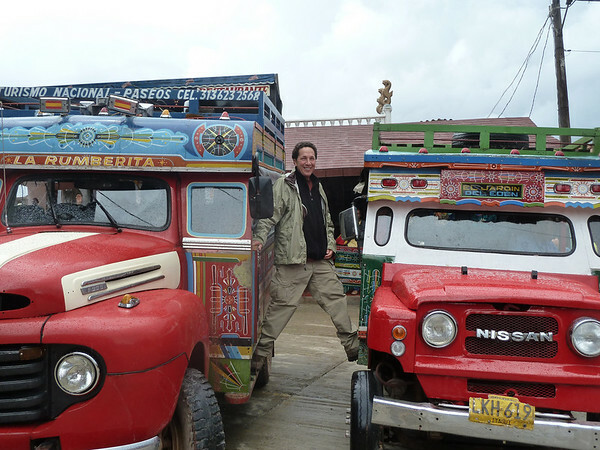 It did rain quite a bit the day I was in Guatape, but it did not diminish the lovely time I had exploring there. Hope you can get your leaks fixed soon.